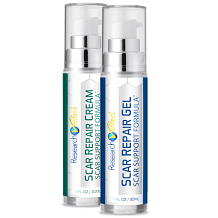 Xeragel is an easy-to-use scar treatment solution that is 100% silicon gel recommended for exposed facial scars. This self-drying, topical gel is completely transparent once it dries after application. It is a good option for those scars where scar sheets would be impractical or unsightly to use. Xeragel, according the the product source, is composed solely of 100% silicon gel. There is no other information listed by the product source as to the active ingredients and inactive, if any. Xeragel does not provide much information as to the recommended dosage for the product other than that the product is to be applied by hand to small scars. Xeragel is also highly recommended for facial scars. Xeragel provides no information on any possible side effects. It is suggested that one contact their healthcare provider to discuss this product before use. In the frequently asked questions (FAQ) section, it also states that Xeragel is safe for use on children. 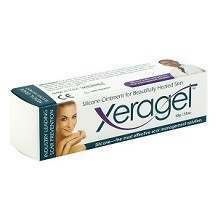 Xeragel seems to be competitively priced with other scar treatment options. The manufacturer of Xeragel offers a 180 day return policy with a possible restocking fee if it is not returned in the first 30 days. The manufacturer must be contacted prior to any returns. All returned products must have the manufacturer’s seals still intact. This seems like a deterrent to prevent the return of the product. After the 180 days, the product is not refundable. This seems to mean that it the product is opened then it cannot be returned. This type of policy is vague as to what qualifies and what does not. The price and guarantee of this product is lacking. Xeragel seems to be very pricey for the amount of product recieved and the guarantee seems to be a deterrent to prevent a consumer, that is not happy with the product, from returning it. It is very vague as to what can or cannot be returned. Also, the manufacuterer seals must be intact. This leads one to believe that if the product is open, then it cannot be returned. However, there is no clear direction as to whether this is the case or not.